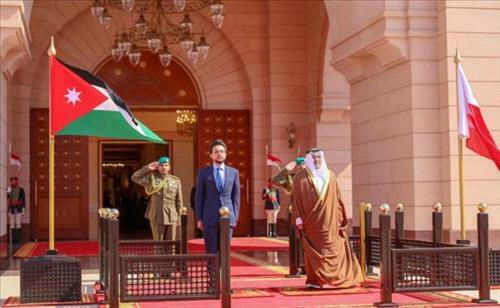 AMMONNEWS - His Royal Highness Crown Prince Al Hussein Bin Abdullah II on Tuesday arrived in the Bahraini capital Manama on an official visit. Upon arrival at Bahrain International Airport, the Crown Prince was welcomed by Prince Salman bin Hamad Al Khalifa, the Crown Prince of Bahrain and Deputy Supreme Commander and First Deputy Prime Minister, as well as a number of Bahraini officials. During the visit, Crown Prince Al Hussein will meet with his Majesty King Hamad bin Isa Al Khalifa of Bahrain, and Crown Prince Salman bin Hamad Al Khalifa. His Highness will also visit a number of Bahraini institutions, and meet with members of the Jordanian community in Bahrain.